Over Thanksgiving, we went over the river and through the woods to see Patrick's grandparents. 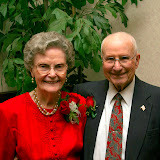 We also helped throw a party celebrating Pop and Polly's 65th Anniversary, which is on December 5. All of Patrick's siblings were able to be there which is quite a feat considering we are spread out all over the country (Idaho, Tennessee, Georgia). Patrick's parents came in from Texas. Our wonderful niece, Reganne, was there, and so there are plenty of pictures of her. We explained to her that she is going to have a cousin who is a boy, but she doesn't have any cousins, so it's a new concept. We are so blessed to have Pop and Polly's example of Christian marriage in our lives. They have witnessed so much history and during Pop's Air Force career, lived all over the country and spent three years in Japan. Pop says the first thing you have to do for your marriage to last 65 years is to live long enough. If we both make it to 2065, we'll be 90 and 95!